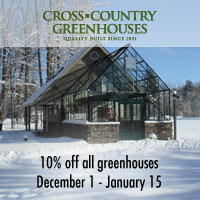 Hurry, our greenhouse sale at Backyard Greenhouses is almost over. Take advantage of our best sale ever by ordering before January 15, 2011. At Backyard Greenhouses we offer over 8,000 greenhouse models and sizes to choose from. Selections include free standing greenhouses, lean-to home attached models, custom and commercial selections in twinwall polycarbonate, fivewall polycarbonate, single or double tempered glass greenhouses. Or, perhaps you'd rather order on our greenhouse layaway plan. Pay a 10% deposit and take up to 6 months to pay. Greenhouse must be paid for in advance of shipping. For more info, call Shelley at 1-800-665-2124. Thank you, and Happy Winter Gardening!